THE INFORMATION IN THIS WEB SITE IS SOLELY PROVIDED FOR THE USE AND ACCESS BY KARLHAUS' CUSTOMERS AND PROSPECTS WITHOUT CHARGE. ANY OTHER USE IS STRICLY PROHIBITED AND SUBJECT TO AN INFORMATION RESEARCH FEE PER ACCESS PER IP ADDRESS. IN ADDITION, BY ACCESSING THIS WEB SITE USERS ARE ALSO EXPRESSLY ACKNOWLEDGING KARLHAUS FEES AND TERMS OF ENGAGEMENT. BUYERS MIGHT BE LIABLE FOR FEES AND SALES COMMISSIONS BY UTILIZING ANY OF KARLHAUS WEB SITES TO FIND AND/OR RESEARCH PROPERTIES AND EFFECTING PURCHASES THOUGH NON-KARLHAUS AGENTS. The works of authorship contained in this Web Site, including but not limited to all design, text and images, are owned, except as otherwise expressly stated, by KARLHAUS REALTY. United States and worldwide copyright laws and treaty provisions protect the contents of this Web Site. Redeliver, transfer, or sell any information, software, lists of users, databases or other lists, products, or services provided through or obtained from the site. This includes among other activities, using "framing, scraping, screen scraping, database scraping, or any other activity with the purpose of obtaining lists of users or other information and includes any of the pages, text, images or other content of this Web Site technology without express written permission. Except for any disclosure by you for technical support purposes, or as specified in our Privacy Statement, all communications from you to this web site will be considered non-confidential and nonproprietary. You agree that any and all comments, information, feedback and ideas regarding our company, products or services that you communicate to KARLHAUS REALTY ("Feedback") will be deemed, at the time of communication to KARLHAUS REALTY, the property of KARLHAUS REALTY, and KARLHAUS REALTY shall be entitled to full rights of ownership, including without limitation, unrestricted right to use or disclose such Feedback in any form, medium or technology now known or later developed, and for any purpose, commercial or otherwise, without compensation to you. You are solely responsible for the content of your communications and their legality under all laws and regulations. You agree not to use this web site to distribute, link to or solicit content that is defamatory, harassing, unlawful, libelous, harmful to minors, threatening, obscene, false, misleading, or infringing a third party intellectual or privacy rights. 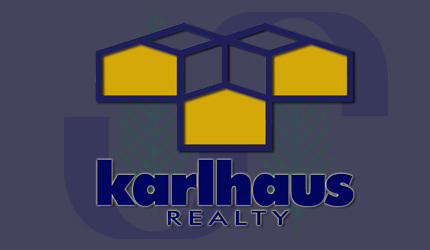 KARLHAUS REALTY does not guarantee the availability of the listings. KARLHAUS REALTY does not make guarantees as to the time it takes for a listing to sell, the likelihood, or duration for a listing to sell. All information is deemed accurate but is not guaranteed. All parties are expected to exercise due diligence and are strongly advised to retain the services of appropriate competent professionals to verify any and all information. KARLHAUS REALTY is not liable for changes in the market that change buyer/seller conditions. You are prohibited from violating or attempting to violate the security of the Web Site, including, without limitation, (a) accessing data not intended for your viewing or logging into a server or account which you are not authorized to access, (b) attempting to probe, scan or test the vulnerability of a system or network or to breach security or authentication measures without proper authorization or (c) attempting to interfere with service to any user, host or network. Violations of system or network security may result in civil or criminal liability. KARLHAUS REALTY may investigate occurrences that may involve such violations and may involve, and cooperate with, law enforcement authorities in prosecuting users who are involved in such violations. The linked sites are not under the control of KARLHAUS REALTY and KARLHAUS REALTY is not responsible for the content of any linked site or any link contained in a linked site. KARLHAUS REALTY reserves the right to terminate any link at any time. KARLHAUS REALTY may provide links from this web site to other sites as a convenience to you and in no way should this be interpreted as an endorsement of any company, content or products to which it links. If you decide to access any of the third party sites linked to this web site, you do this entirely at your own risk. KARLHAUS REALTY DISCLAIMS ANY AND ALL WARRANTIES, EXPRESS OR IMPLIED, TO ANY SUCH LINKED SITES, INCLUDING BUT NOT LIMITED TO ANY TERMS AS TO THE ACCURACY, OWNERSHIP, VALIDITY OR LEGALITY OF ANY CONTENT OF A LINKED SITE. THE WEB SITE IS PROVIDED "AS-IS" AND "WITH ALL FAULTS" AND, TO THE MAXIMUM EXTENT PERMITTED BY APPLICABLE LAW, KARLHAUS REALTY DISCLAIMS ALL OTHER REPRESENTATIONS AND WARRANTIES, EXPRESS, IMPLIED OR STATUTORY, REGARDING THE WEB SITES, INCLUDING WITHOUT LIMITATION ITS FITNESS FOR A PARTICULAR PURPOSE, ITS QUALITY, ITS MERCHANTABILITY, ITS PERFORMANCE, ITS NON-INFRINGEMENT OF THIRD PARTY RIGHTS, TITLE, OR THE RESULTS OBTAINED BY USING THE WEB SITE. KARLHAUS REALTY DOES NOT WARRANT THAT THE WEB SITE IS FREE FROM BUGS, VIRUSES, ERRORS OR OTHER PROGRAM LIMITATIONS. KARLHAUS REALTY MAKES NO WARRANTY THAT (i) THE SERVICE WILL MEET YOUR REQUIREMENTS, (ii) THE SERVICE WILL BE UNINTERRUPTED, TIMELY, SECURE, OR ERROR-FREE, (iii) THE RESULTS THAT MAY BE OBTAINED FROM THE USE OF THE SERVICE WILL BE ACCURATE OR RELIABLE, (iv) THE QUALITY OF ANY PRODUCTS, SERVICES, INFORMATION, OR OTHER MATERIAL PURCHASED OR OBTAINED BY YOU THROUGH THE SERVICE WILL MEET YOUR EXPECTATIONS, AND (V) ANY ERRORS IN THE SOFTWARE WILL BE CORRECTED. You will indemnify, defend and hold harmless KARLHAUS REALTY and its officers, directors, employees and agents (each, an "Indemnified Party") from and against any and all claims, demands, losses, costs, expenses, liabilities and damages of any kind or nature whatsoever (collectively, "Damages") incurred by any Indemnified Party arising out of, in connection with or resulting from (i) your use of the Web Site or (ii) your breach of this Agreement. Pursuant to US Code, Title 47, Chapter 5, Subchapter II, p.227, any and all non solicited commercial E-mail sent to the domain flyinrealty.com is subject to a download and archival fee in the amount of Five-Hundred Dollars U.S. E-Mailing denotes acceptance of these terms. This Agreement shall be construed and governed by the State of Florida. You hereby consent to the exclusive jurisdiction and venue of courts sitting in Florida in all disputes arising out of or relating to the use of the Web Site. Use of the Web Site is unauthorized in any jurisdiction that does not give the effect to all provisions of these terms and conditions, including without limitation this paragraph.